1 ) What made you start your show? 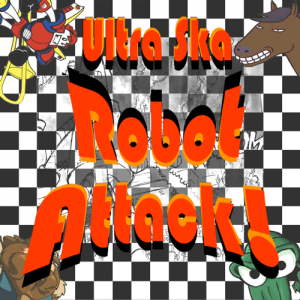 The Ultra Ska Robot Attack started up a few years ago (2010) with founding members Ben and Rhys. It presumably came from a deep unsatisfied need for Ben and Rhys to share their hooliganism on the air waves, also ska. The show is currently co-hosted by Ben, Ky, and Simon (aka Checkers the horse). We’re all undergrads (or in the case of Rhys, was) at UNB studying physics, and have been doing so for about 4 years. That might seem oddly specific, but it’s pretty important considering that’s how we all met. At first it was a bit frustrating trying be a lab partner with a horse (a lack of opposable thumbs really makes calibrating instruments difficult), but we eventually overcame that obstacle and became great friends. 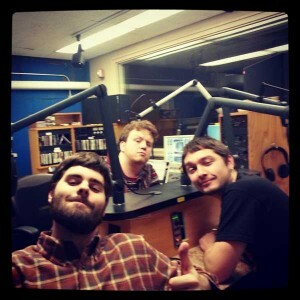 Hosts: Ben (back), Simon (right), & Ky (front). Before Simon and Ky started co-hosting the show Ben and Rhys had already interviewed The Planet Smashers, an amazing Canadian ska band; that guest would be pretty hard to top. As far as Canadian bands go Rude City Riot is one of our favorites, and it would be super rad if they came on the show. Going international, the craziest guest we’d love to have on the show would probably be Leningrad. They’re a Russian band that is supposedly so vulgar that the mayor of Moscow has banned them from playing at any large events within the city. We’re all students at UNB so it made sense for us to use such great resource located conveniently on campus. Besides that, CHSR is the most open and diverse media outlet in town. Who else would let 3 twenty-something guys with no previous experience talk about, and play some ska for an hour every Monday night? All of us current members are graduating next year (fingers crossed), and we will be going our separate ways all over the world. We don’t have any direct succession planned locally, but we are exploring ways of syndicating the show to keep our content flowing. Until then we want to finish our stay in Fredericton with style, hopefully by sprucing up the ska scene in town! Tune in while you can to Ultra Ska Robot Attack Monday nights at 10pm!